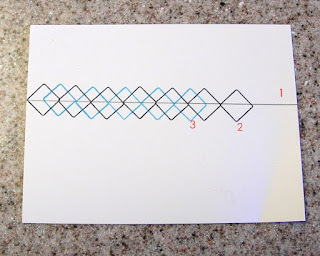 Another card for this week's OLW challenge, hosted by Heather, to use squares. This card was inspired by the grade-school technique of pasting squares of tissue paper onto your page (see inspiration photo below). 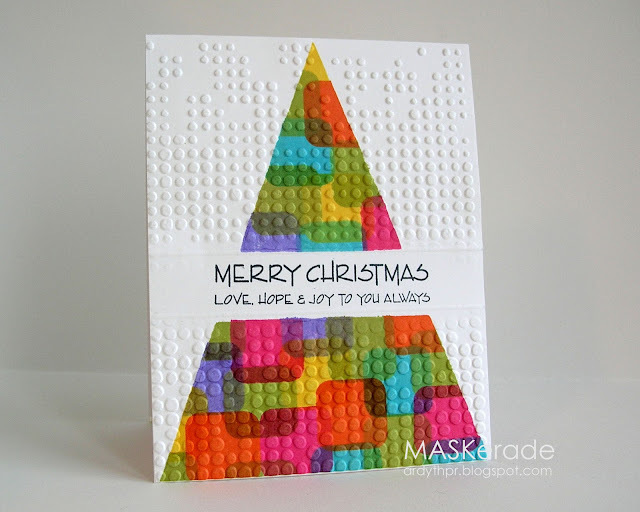 I masked the big triangle and the sentiment strip across the centre before stamping the overlapping squares (unfortunately, my square stamp has rounded corners) in multiple colours. I then removed the masks, ran it through the Cuttlebug with the sentiment strip covered to ensure no embossing there and finally scored a border on the top and bottom of the sentiment strip. I love the modern feel this has - I'm getting a Lego vibe, too! PS - thank you all for thinking I'm so awesomely patient and talented to stamp every little square perfectly lined up on yesterday's card. I wish I was that awesome. I obviously did not explain myself very well (except to Darnell, whose mind must work like mine (I'm so sorry, Darnell! lol!)). 4) coloured the little squares created by stamping the bigger squares (not shown). They say a picture is worth a thousand words, so hopefully this makes my 'secret process' a little clearer! I'm STILL impressed with yesterday - perhaps even more so that you could visualize those bigger squares making smaller squares!! And today is truly stunning! Wow, this is a most fabulous tree! You totally brought across the layered tissue idea with this design! Yes! Yes! You are definitely the Queen of Geometric. AND the Queen of Unique. 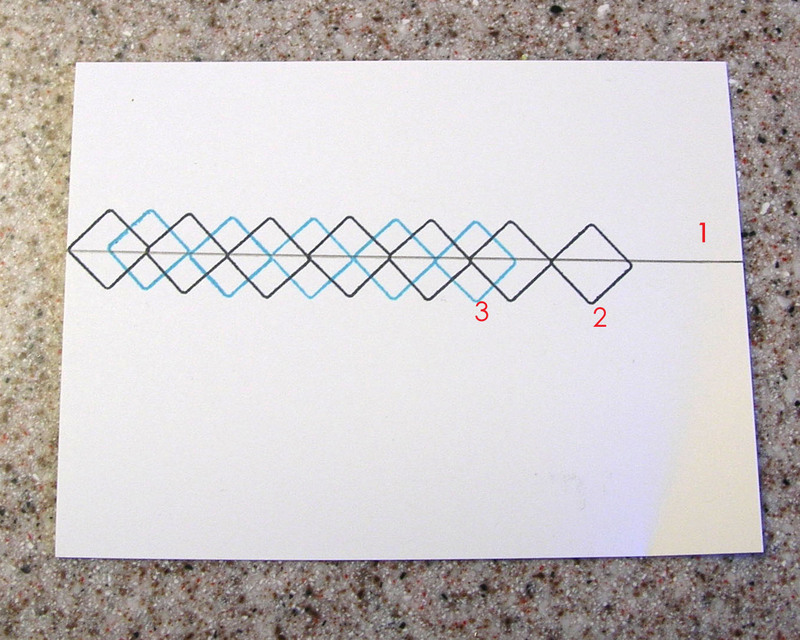 I'm no less impressed with yesterday's card, now that you've "simplified" the process. It still takes a megaton of precision that probably is uniquely yours. And then you go and do that smashing tree today! ....I still think that there is no way anyone other than you could pull this off with such precision! Thanks for the detailed instructions. Unfortunately? I think the tree looks extra-funky with your rounded-corner stamp! I just cannot say enough about how cool this is Ardyth. Totally Lego-esque and I like that the squares have rounded corners. You're still pretty awesome even if you didn't stamp a million tiny squares! LOL! Thanks for the photo explanation! All the colour in this card is gorgeous and the embossing reminds me of lego! LOL! I came back to look at this card again and just saw what you wrote! You're sweet, hon, apologizing! What I wouldn't give for HALF how your mind works!! Egads, you really need to stop this madness!!!! Oh how I love this card! The squares, the circles and the big triangle! And then I see your photo about the earlier post, and I sneak a peek at that one, oh my. How clever is that one too?! I am not sure I understand how you did it but even so, the result is AMAZING!!!!!!!!!!!!!!!! Well this one escaped me until I checked out Cath's Pinterest of fave cards. Wowzer. This is uber-cool. I just love those overlaid mod squares. As a kid I used to sit and stare at our Christmas tree with squinty eyes just to get that effect.